This was the powerful message from community development specialist, Sizwe Mxobo an alumnus of the Go for Gold education-to-employment programme in his address to 82 students, who were today recognised for their extraordinary achievements at the 17th annual Go for Gold awards. His message encouraging resilience, hard work and determination to succeed was echoed by the young Go for Gold students who paid tribute to Go for Gold for helping them develop the self-belief and confidence necessary to lift them out of poverty. “Never fail to do your best, for what you plant now you will harvest later. Do not watch the clock but do what it does – keep going. Accept the challenges so that you can feel the exhilaration of victory,” said Go for Gold Phase 2 student, Tamsyn-Lee Simeon, who will start her studies to become a Civil Engineer in 2016. Go for Gold students selected for the programme come from disadvantaged communities and attend schools which are under-resourced. In Phase 1 of the programme, Go for Gold selects Grade 11 and 12 high school learners who show an aptitude for Maths and Science and then provides after-school and Saturday morning Maths and Science tuition while simultaneously developing the learner’s social and emotional education, during weekly Life-Skills sessions. 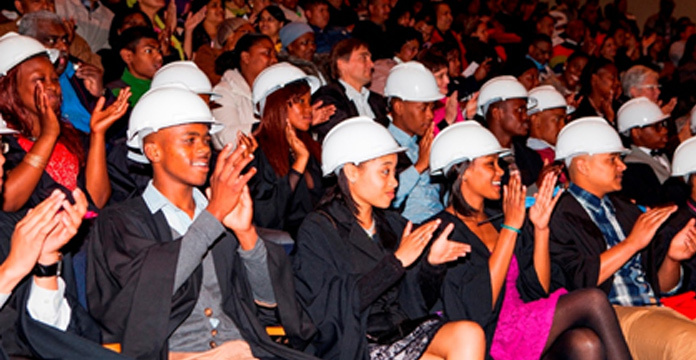 Once students matriculate they are employed for a year by partner companies in the construction sector as general worker interns (Phase 2), enabling them to experience the working world while continuing to receive Saturday bridging classes in Maths, Science and Life-Skills, to better prepare them for their tertiary studies. “Our annual awards ceremony is a wonderful celebration of the incredible commitment and determination shown by our Go for Gold students who, despite their generally poor socio-economic circumstances, grab hold of the opportunity to get a tertiary education by diligently attending extra classes and working hard to improve their marks,” says Go for Gold Programme Director, Patti Bruyns. On average 80% of Go for Gold Phase 1 learners matriculate with a Bachelor pass rate, enabling them to study at University. Once the students complete their internship year they start their Phase 3 tertiary academic studies, with most fully sponsored by the same company who undertake to employ them once they graduate. Amanda Filtane, a Go for Gold alumnus who graduated from UCT with a BSc Honours in Construction Management and now works as a Project Manager with the Department of Rural Development and Land Reform became the first Go for Gold Honorary Ambassador. She helped start LAMPS, an after-school tuition NPO through which young people in the township receive tuition and are assisted to apply for tertiary studies and bursaries. “Amanda has, despite great odds and with tremendous resilience, carved a place for herself in a field dominated by men. She stands out for both her professional achievements and commitment to give back to Go for Gold and her community. We are extremely proud to honour her with this award,” said Patti.